Sasaki Time: Giveaway: Applebee's $50 Gift Card! For me, I'm hungry, lol. Thank you. My husband, son, and I would use it together. i would take the whole family out! I would use it to take my family out to dinner. Something we haven't done in a long time. I would give it to my brother to take out his wife! This would be for me and my family. I definitely would keep this for our family to eat with! It would be for me and my parents! I would share this with my family. Thanks for the chance to win! I think my hubby and I would use this to go on a date! I would give it to my parents for a date night, They never get to go out alone! We would use this for a nice family dinner. I would give this to my mommy! I would keep it for myself, with a family of 6 it would help for us to eat out. This would be for me and my kids. For me and my boys!! would be for my family! I would use it for my husband's birthday dinner that is coming up in January!! Thanks so much for the opportunity to win!! Gift for my boyfriend. He loves Applebee's! I'd take my friends out for some drinks! This would be for me. I would take my husband out to dinner. I would take my mom out for dinner! Well, technically I'd keep it, but I'd use it for a nice date night. I would take my son and daughter in law out to dinner. 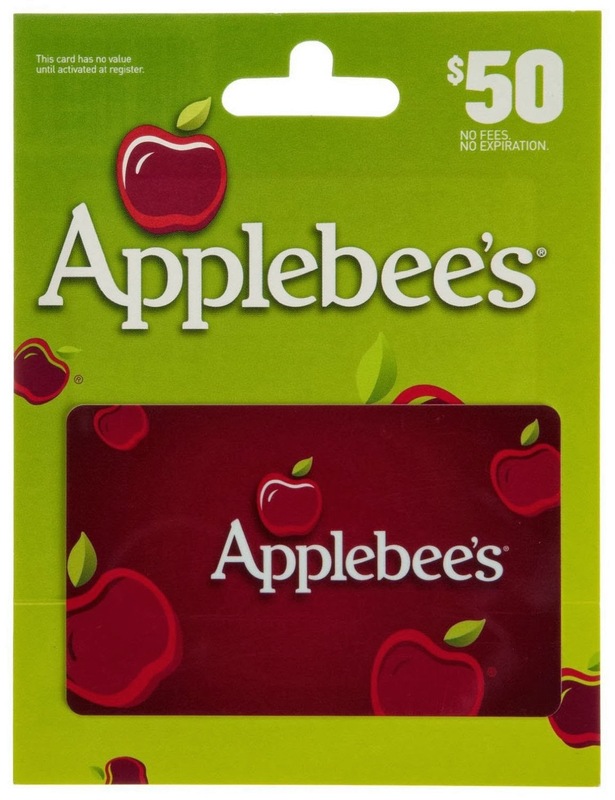 This gift card would be for the whole family! This would be for my family!! I would give it to my son. He loves Applebee's. I would use this to take my mom out to dinner. Oh, Hubby and I would enjoy this together! Thanks for the chance to win! It would be for me and my husband. My Dad just passed away 2 months ago, so I would ask my Mom to join my husband and I and the kids. She could sure use some cheering up!! I love Applebees. We always go when they give Veterans a free dinner and try to go one or twice a year at least. So I would keep it and take my mom and dad to lunch. I would take my son, daughter-in-law, and grandson out to eat. Thank you for the chance to win! I would use it for our anniversary this year. It would be great to go out, eat, and not worry about the bill. For me and my family, they all love to eat out! haven't been out in so long, i'd keep it for myself. I would use this card for a date night with my husband. Thanks so much for hosting this giveaway! for my family- there is an Applebee's on our street. I would take my mom out for dinner. I would give it to my daughter-in-law who has a birthday in January. Id use this gift card. Well, it's no fun eating alone, so I'll probably treat my family. I would take my husband out on a well-deserved date. I would keep it to take my husband out on a date night. It's for me and the family! It would be for me & family. This is one of the rare restaurants we have in our small rural town. For me and my hubby. We love Applebee's! I would take my family out to dinner. Normally I would give it to someone but life has been crazy lately, I think I would use it for the hubby, kids and I to have dinner. I would take my mom for lunch. She loves applebees! This would be date night for my husband and I! It would be for me for sure! this would a gift for my daughter...to take her family out to dinner! I would keep this for me - I LOVE their Oriental Chicken Salad.